The National Science Foundation (NSF) today realized the initial phase of its $30 million investment to upgrade the nation’s computational research infrastructure through the dedication of Stampede2, one of the most powerful supercomputing systems in the world. Based at the Texas Advanced Computing Center (TACC) at The University of Texas at Austin, this strategic national resource will serve tens of thousands of researchers and educators across the U.S.
“Building on the success of the initial Stampede system, the Stampede team has partnered with other institutions as well as industry to bring the latest in forward-looking computing technologies combined with deep computational and data science expertise to take on some of the most challenging science and engineering frontiers,” said Irene Qualters, director of NSF’s Office of Advanced Cyberinfrastructure. Stampede2 is the newest strategic supercomputing resource for the nation’s research and education community, enabling scientists and engineers across the U.S., from multiple disciplines, to answer questions at the forefront of science and engineering. Importantly, Stampede2 leverages NSF’s existing investments in computational and data science, as well as user services, allowing academic researchers access to capabilities beyond the reach of a single institution while complementing other national high-performance computing infrastructure. Further, Stampede2 builds upon the initial Stampede system, also funded by NSF, which processed more than eight million successful jobs and delivered over three billion core hours of computation since it became operational in 2013. Stampede2 will offer more than twice the overall memory, storage capacity, bandwidth and system performance of the initial Stampede system. Yet Stampede2 will consume only half as much power and occupy just half the physical space of its predecessor. 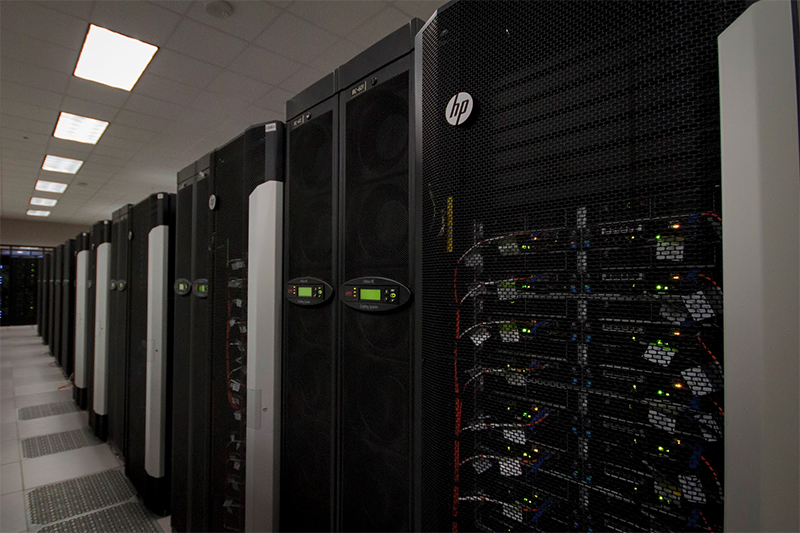 Innovations in how the supercomputer is cooled also resulted in efficiencies: Stampede2 is connected to a chilled water system that cools more cost-effectively and with less impact to the power grid than the standard air-conditioned approach. Once additional hardware and processors are added in the summer, Stampede2 will be able to process jobs at 18 petaflops, or 18 quadrillion mathematical operations per second, at peak performance. When Stampede2 is fully operational later this fall, the system will have roughly the processing power of 100,000 desktop computers; this increased speed and power will allow scientists and engineers to tackle larger, more complex problems that were not previously possible. Computational scientists and engineers pursuing a wide range of applications — from researchers who conduct large-scale simulations and data analyses on large swaths of the system, to those who interact with the system through web-based community platforms — will access Stampede2 through the NSF-supported eXtreme Science and Engineering Discovery Environment (XSEDE). Tumor identification from magnetic resonance imaging (MRI) data at The University of Texas at Austin. Real-time weather forecasting at the University of Oklahoma that has helped direct storm-chaser trucks. Earthquake predictions for the Southern California region at the University of California, San Diego that achieved a fivefold performance improvement over previously reported results. Teams from Stephen Hawking’s cosmology research laboratory at Cambridge University, leveraging Stampede2, achieved unprecedented comparisons of previously performed simulations with gravitational wave data observed by the NSF-funded Laser Interferometer Gravitational-wave Observatory (LIGO). Several leading universities are collaborating with TACC to enable Stampede2, including Clemson University, Cornell University, Indiana University, The Ohio State University and the University of Colorado at Boulder. They are joined by industry partners Dell EMC, Intel Corporation and Seagate Technology, who are providing cyberinfrastructure expertise and services for the project. Stampede2 is expected to serve the scientific community through 2021, supporting tens of thousands of researchers during this period. An additional NSF award for $24 million was recently granted to cover upcoming operations and maintenance costs for the system. 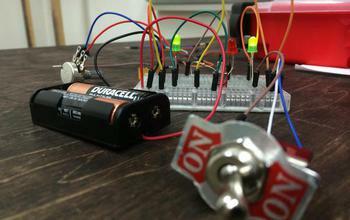 Now, modern-day tinkerers of do-it-yourself technology, known as makers, are driving a new era of American innovation. Makers cross all age, background and skill levels, from early childhood through adulthood. They have in common the determination to see their ideas come to life. Making has a wide appeal. Making allows people to follow their own interests, to create something uniquely theirs, and to apply the knowledge they have gained to produce products that meet societal needs. Making offers the opportunity to learn and apply science, technology, engineering and mathematics (STEM) knowledge and processes, including collaboration, communication and iterative design. NSF’s early investments in fundamental technologies and techniques have helped to enable the maker movement. For example, NSF strategic investments in additive manufacturing and computer science enabled many of the innovations underlying 3-D printing, computer-aided design, geometric modeling and embedded systems. 3-D printing alone is a keystone of making. With desktop 3-D printers, students and learners of all ages can experience firsthand the challenges and opportunities of manufacturing. NSF also has a history of support for education within its investments in engineering research centers and science and technology centers. Education programs include out-of-school activities and challenges that engage students and teachers in the manufacturing process. NSF supports a wide range of making, from community engagement to education and workforce development, to research on learning, to manufacturing and commercialization. NSF funds making-related activities across fields. 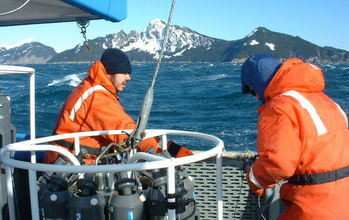 NSF invests millions of dollars in making-related activities and research each year. NSF partners with academic institutions, other federal agencies and industry to promote access to making tools, spaces, collaborators, mentors and advisors, and to study the impact on learning. NSF adheres to a public access policy, fostering the democratization of knowledge and resources, a core tenet of making. spur innovation across a broad range of technologies, leading to the creation of small businesses. provide a better understanding of who participates in making, in what contexts, how and why. study the outcomes of making and participation in making, including the development of metrics and instrumentation. enhance the understanding and practice of how making can foster STEM learning. seek to understand how making can be leveraged to broaden participation in all areas and types of STEM interests and careers. Highlight opportunities to support research and education in these and other topics across the agency, building on the significant investments that it has already made. Catalyze conversations between researchers and practitioners, including representatives from organizations such as community maker spaces, engineering schools, libraries and museums, and manufacturers. Leverage existing relationships with universities and industry to encourage integration of maker activities and spaces into the school curriculum and in out-of-school environments. Develop technologies and kits that promote student engagement in design, advanced manufacturing and STEM. Broaden participation in making by individuals from underrepresented groups. Develop an evidence-driven knowledge base about effective learning outcomes. Ellie White of Barboursville, West Virginia, and her family launched a campaign called Go Green Bank Observatory convince the National Science Foundation to not divest from Green Bank Observatory. Jesse Wright / West Virginia Public Broadcasting. Since the observatory opened in 1957, researchers have used the facility to make several discoveries, like organic prebiotic molecules — the building blocks of life. The Green Bank Telescope is also one of only two radio telescopes in the world searching for signs of intelligent life in space. The GBT plays a key role in the Breakthough Listen project, and roughly 20% of the time available on the GBT is dedicated to this research. Breakthrough Listen is also carrying out the deepest and broadest ever search for optical laser transmissions. These spectroscopic searches are 1000 times more effective at finding laser signals than ordinary visible light surveys. They could detect a 100 watt laser (the energy of a normal household bulb) from 25 trillion miles away. But today, the telescope and the facility that supports it are under federal review — with the possibility of losing funding or being dismantled. In the face of that threat, one West Virginia family hopes to convince the powers that be of the facility’s value to science, education and the small town in which the telescope resides. White’s family volunteered to start a campaign called Go Green Bank Observatory to rally support from across the country and show the National Science Foundation, which used to almost completely fund the observatory, that Green Bank Observatory is worth keeping. In 2012, the NSF published a portfolio review that recommended at least partially divesting from several observatories around the country that no longer have as large of a scientific impact as they used to. Green Bank Observatory was on that list. Proposed operational changes for Green Bank Observatory range from continuing to partially fund its operations to shutting down its research operations and turning it into a technology park, or completely tearing it down. Last fall, Go Green Bank Observatory encouraged fans to speak at two public scoping meetings where Ahjar and other representatives from the NSF would be present to hear the public’s input about the divestment process. About 350 people filled the seats of an auditorium at the observatory. Several in attendance were affiliated with West Virginia University, which since 2006 has received more than $14.5 million in grant dollars for research related to the Green Bank Telescope. Others, like Buster Varner, a local fire chief, were more concerned about Green Bank Observatory’s role in the community as a de facto community center, where people can hold meetings and classes. The NSF once almost completely funded Green Bank Observatory’s operations. But Holstine said that especially in the past five years, the observatory saw a need to diversify its sources of funding — in part because outside organizations and researchers expressed a willingness to pay for time on the telescope, but also due to the clear indicators that the observatory needed to rely less on the NSF. Green Bank Observatory employs between 100 and 140 people — more than half of whom are from Pocahontas County — depending on the time of year. The money also helps the observatory maintain its own infrastructure in an isolated and rural area. For White, the Observatory isn’t only worth keeping because of its accomplishments — but also because of its efforts to train the next generation of scientists. When she was younger, White was convinced she wanted to be an artist when she grew up. But since playing among the telescopes as a child, she has gone on to work on projects under the mentorship of astronomers and graduate students from all over the world. 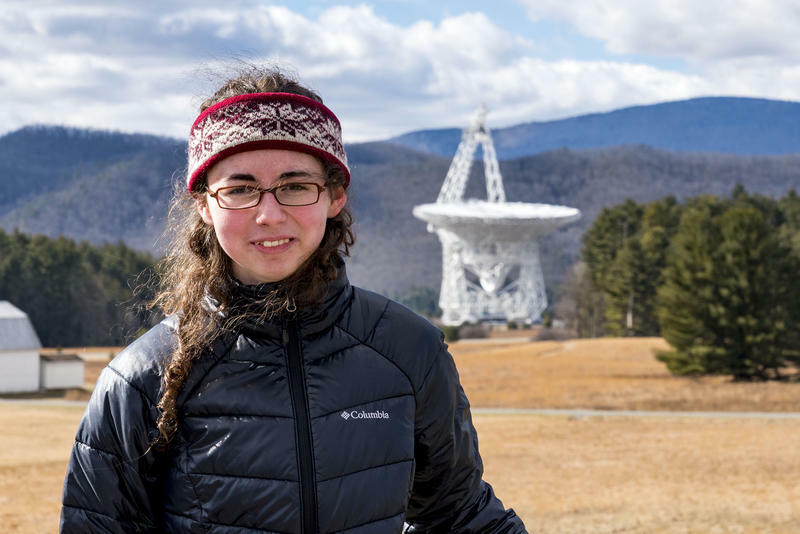 She’s not the only teen who’s been impacted by the observatory’s work; through the Pulsar Search Collaboratory, more than 2,000 high school students have worked with the Green Bank Observatory through a partnership with West Virginia University since 2007. “Just generally being here, you learn something every day. It’s like learning a new language through immersion,” White said. The NSF will reach its decision about the Green Bank Observatory’s fate by the end of this year or the beginning of next year. At 16 years old, White hopes to get her doctorate in astrophysics and one day find full employment at the observatory. If it shuts down, White said, she might have to look for employment out of state. US National Science Foundation looks to slash funding for Puerto Rico’s Arecibo Observatory. Researchers hope that there is a way to stop the iconic Arecibo Observatory from closing down. It is the radio telescope that hunts killer asteroids, probes distant cosmic blasts and decades ago sent Earth’s most powerful message to the stars. Yet the storied Arecibo Observatory, an enormous aluminium dish nestled in a Puerto Rican sinkhole, might soon find itself out of the science game. The US National Science Foundation (NSF), which owns the observatory, wants to offload the facility to free up money for newer ones. In the coming weeks, it will ask for ideas about how Arecibo might be managed if the NSF reduces its current US$8.2-million annual contribution. By May, the agency plans to release a final environmental-impact statement, a federally mandated analysis of the effects of various scenarios — from continuing to run Arecibo to mothballing or even demolishing its iconic dish. Soon after that, the NSF will decide which path to take. Arecibo advocates are not going to let the telescope die without a fight. On 4 January, they pressed their case at a meeting of the American Astronomical Society in Grapevine, Texas — arguing that Arecibo is putting out some of the best science it has ever done, and that the NSF is moving too quickly to divest itself of an astronomical treasure. Arecibo is playing a key part in illuminating the mystery of fast radio bursts, which are emerging as a completely new class of celestial phenomenon. And at the astronomy meeting, observatory scientists revealed a previously unknown contributor to the Universe’s cosmic microwave background glow — cold electrons — plus a pair of pulsars that has surprisingly erratic radio emissions. “It is still a state-of-the-art observatory,” says Nicholas White, senior vice-president for science at the Universities Space Research Association in Columbia, Maryland, which helps to manage Arecibo for the NSF. NSF officials agree. But they say they need money for new projects such as the Large Synoptic Survey Telescope, which is under construction in Chile (see ‘On the block’). A 2012 review of the NSF’s astronomy portfolio recommended cutting support for some of its smaller and older facilities. Although Arecibo was not among them, the report recommended that the NSF evaluate the facility’s status later in the decade. SOAR, Southern Astrophysical Research; WIYN, Wisconsin–Indiana–Yale–National Optical Astronomy Observatory. Some of the observatories targeted in the review have found potential partners: New Mexico State University in Las Cruces is leading an effort to take over the Dunn Solar Telescope in Sunspot, New Mexico. Others remain in limbo, including the 100-metre radio telescope in Green Bank, West, where university partners have offered limited help. In October, the NSF released a draft environmental impact statement for Arecibo that outlines how various management options would affect everything from endangered plants to local tourism. The NSF would prefer to find collaborators to shoulder most of the cost of operating the observatory for science purposes. But the draft statement includes the possibility of shuttering the facility, and even details which explosive would be needed to dismantle the 305-metre-wide dish. NSF officials included this bleak option to satisfy federal rules that require them to describe the environmental impact of all possible outcomes. “We specifically leaned towards making things look a bit more drastic,” says James Ulvestad, head of the NSF’s astronomy division. The NSF pays for roughly two-thirds of Arecibo’s $12-million annual budget. Half of that comes from its astronomy division and half from its atmospheric and geospace sciences division, which uses Arecibo to study Earth’s ionosphere. The remainder comes from NASA, which tracks near-Earth asteroids from Arecibo and would probably keep doing so if other collaborators stepped in to make up for NSF cutbacks. Arecibo’s current operating contract ends in March 2018. After that, new approaches to make ends meet could include charging scientists hourly rates to use the observatory, instead of having them apply for time through federal agencies. “This is where the rubber hits the road,” says White. Women in Networking @SC (WINS) Kicks off this week in Salt Lake City! (Left to Right) Julia Locke (LANL), Debbie Fligor (SC15 WINS returning participant, University of Illinois at Urbana-Champaign), Jessica Schaffer (Georgia Tech), Indira Kassymkhanova (LBNL), Denise Grayson (Sandia), Kali McLennan (Univ. of Oklahoma), Angie Asmus (CSU). Not in photo: Amber Rasche (N. Dakota State) and Julie Staats (CENIC). The University of Corporation for Atmospheric Research (UCAR) and The Keystone Initiative for Network Based Education and Research (KINBER) together with the Department of Energy’s (DOE) Energy Science Network (ESnet) today announce the official launch of an Networking at SC (WINS) program. Funded through a grant from the National Science Foundation (NSF) and directly from ESnet, the program funds eight early to mid-career women in the research and education (R&E) network community to participate in the 2016 setup, build out and live operation of SCinet, the Supercomputing Conference’s (SC) ultra high performance network. SCinet supports large-scale computing demonstrations at SC, the premier international conference on high performance computing, networking, data storage and data analysis and is attended by over 10,000 of the leading minds in these fields. The SC16 WINS program kicked off this week as the selected participants from across the U.S., headed to Salt Lake City, the site of the 2016 conference to begin laying the groundwork for SCinet inside the Salt Palace Convention Center. The WINS participants join over 250 volunteers that make up the SCinet engineering team and will work side by side with the team and their mentors to put the network into full production service when the conference begins on November 12. The women will return to Salt Lake City a week before the conference to complete the installation of the network. The WINS participants will support a wide range of technical areas that comprise SCinet’s incredible operation, including wide area networking, network security, wireless networking, routing, network architecture and other specialties. Funds are being provided by the NSF through a $135,000 grant and via direct funding from ESnet supported by Advanced Scientific Computing Research (ASCR) in DOE Office of Science. Funding covers all travel expenses related to participating in the setup and operation of SCinet and will also provide travel funds for the participants to share their experiences at events like The Quilt Member Meetings, Regional Networking Member meetings, and the DOE National Lab Information Technology Annual Meeting. The program also represents a unique cross-agency collaboration between the NSF and DOE. Both agencies recognize that the pursuit of knowledge and science discovery that these funding organizations support depends on bringing the best ideas from people of various backgrounds to the table. Created in 1986, the U.S. Department of Energy’s (DOE’s) Energy Sciences Network (ESnet) is a high-performance network built to support unclassified science research. ESnet connects more than 40 DOE research sites—including the entire National Laboratory system, supercomputing facilities and major scientific instruments—as well as hundreds of other science networks around the world and the Internet. Talk about a great summer gig. For 10 weeks, Dana Harvey learned all about modern research methods and tools through a National Science Foundation (NSF) program: Research Experience for Undergraduates (REU). “I got to see what it is like to really work in a lab,” said Harvey, a physics major at Davidson College in North Carolina. “It was a great experience. I learned a lot and got to do some cool research.” Harvey was one of six students who participated in this year’s program. The students each worked with a mentor throughout the program. In April, Black Hills State University (BHSU) received a grant of more than $250,000 from the NSF to support students participating in undergraduate science research at Sanford Underground Research Facility (Sanford Lab). The funds will be used over three years to provide 21 college-level students a 10-week hands-on research experience. The program director, Brianna Mount, an assistant research professor at BHSU, said the program gives student researchers opportunities to engage in research related to some of the most important physics experiments of our time—searching for dark matter and investigating properties of the neutrino—as well as research in other scientific fields, specifically chemistry and biology. “Students will use this experience as a spring-board toward pursuing a career in science. This will help students prepare for graduate school or careers in astrophysics, microbiology and environmental chemistry,” said Mount. The program also helps students become proficient in both day-to-day lab procedures and data analysis. They develop their abilities to communicate science through speaking and writing as well, said Mount. Students supported by the grant funds lived on campus and worked with BHSU faculty mentors at the BHSU Underground Campus (BHUC) at Sanford Lab in Lead. The BHUC is a unique, world-class research space for scientists from institutions around the globe, enabling discovery in many disciplines. The BHUC also works with researchers from the Berkeley Low-Background Facility, which gives additional opportunities to the REU students. In addition to working on their summer research projects, students worked with BHSU faculty and staff on career mentoring, including professional development sessions on selecting graduate schools and applying for jobs in scientific industries. Kingsley Vincent Chow, Diabolo Valley College, Pleasant Hill, Calif.
Joseph Barnes, Benedictine College, Atchison, Kan.
Patrisse Vasek, Oglala Lakota College, Kyle, S.D. Dana Harvey, Davidson College, Davidson, N.C.
Pauline Dredger, Kansas State University, Manhattan, Kan.
Today, the National Science Foundation announced a $110 million, five-year award to the National Center for Supercomputing Applications at the University of Illinois at Urbana-Champaign and 18 partner institutions, including the Texas Advanced Computing Center at The University of Texas at Austin, to continue and expand the activities undertaken through the Extreme Science and Engineering Discovery Environment, a cornerstone of the nation’s cyberinfrastructure ecosystem. XSEDE accelerates open scientific discovery by enhancing the productivity and capability of researchers, engineers, and scholars, and broadening their participation in science and engineering. It does so by making advanced computational resources easier to use, integrating existing resources into new, powerful services, and building the community of users and providers. The project is a central feature of NSF-supported cyberinfrastructure and aligns with the strategic objectives of the National Strategic Computing Initiative (NSCI) – a whole-of-government effort that fosters a coordinated Federal strategy in high-performance computing (HPC) research and deployment. XSEDE 2.0 aligns with NSCI, particularly by holistically expanding the capabilities and capacity of a robust and enduring national HPC ecosystem and contributing the learning and workforce development necessary to prepare our current and future researchers and the critical technical experts needed to support the research enterprise. Cyberinfrastructure refers to the advanced instruments, computing systems, data tools, software, networks, and people that collectively improve the research productivity of the nation’s computational scientists and engineers, enabling breakthroughs not otherwise possible. Critically important to cyberinfastructure is the increasingly dynamic interplay between these resources and human developers and users. XSEDE 2.0 constitutes a virtual organization that provisions complex distributed infrastructure, support services, and technical expertise. TACC is a key partner in the XSEDE project offering HPC resources, diverse domain and visualization experts, scalable cloud environments, data analytics, and replicated storage. 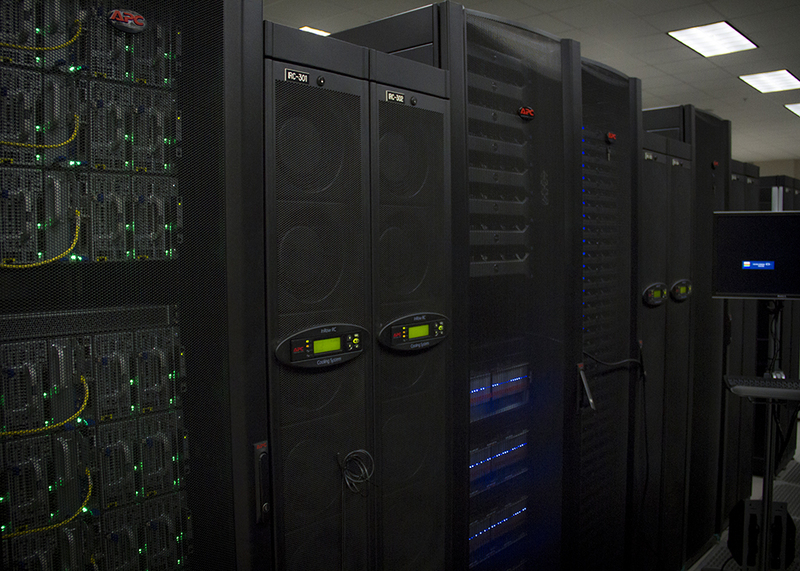 Stampede, TACC’s flagship system, is the largest, most capable system for academic research in the U.S. In addition, TACC leads the XSEDE User Portal, a web interface that allows users to monitor and access XSEDE resources, manage jobs on those resources, report issues, and analyze and visualize results. TACC also leads XSEDE’s Community Engagement and Enrichment (CEE) program, which focuses on user services and engaging a new generation of diverse computational researchers. In addition to education, training and outreach activities, CEE connects to campus research computing communities to help researchers access both local and national resources. XSEDE was first established in 2011, and the award announced today provides a continuity of services valuable to its large user community, in particular the coordination of resources and people that make the national cyberinfrastructure ecosystem so effective. Last year, XSEDE provided computational and data services to more than 6,000 scientists, engineers and students, and supported more than 20,000 users through its web portal. Over the past four years, users have acknowledged support by XSEDE and its related computational resources in roughly 14,000 publications. Among these XSEDE-supported studies were efforts that confirmed the discovery of gravitational waves, developed high-resolution maps of the Arctic, uncovered the structure of HIV, and helped prevent injuries from car accidents. Continue to improve and operate an integrated HPC capability of national scale, providing “one-stop-shop” experience for users across the XSEDE-coordinated cyberinfrastructure ecosystem. For nearly four decades, NSF has supported the nation’s scientific community by providing nationwide access to advanced computing resources and services beyond the reach of individual academic institutions. This access has enabled transformative research in such diverse areas as particle physics, cosmology, biology, nanotechnology, ecological modeling, economics and civil engineering. Students and researchers interested in obtaining access to advanced digital resources and support from XSEDE 2.0 can learn more and register here. The National Science Foundation (NSF) has awarded a collaborative team led by researchers at six different institutions a $15 million, five-year grant to establish a Science Gateways Community Institute (SGCI) to accelerate the development and application of highly functional, sustainable science gateways that address the needs of researchers across the full spectrum of NSF directorates. The institute is a partnership led by the San Diego Supercomputer Center, in collaboration with the Texas Advanced Computing Center (TACC) at The University of Texas at Austin; Elizabeth City State University in North Carolina; Indiana University; University of Notre Dame; Purdue University; and the University of Michigan at Ann Arbor. As the lead partner for the Scientific Software Collaborative, TACC will receive almost $3 million to oversee a component-based, open-source, extensible framework for gateway design, integration, and services, including gateway hosting and capabilities for external developers to integrate their own software into Institute offerings. TACC will also be participating in other aspects of the project including Community Engagement and Extended Developer Support. The Institute’s goal is to increase the number, ease of use, and effective application of gateways for the greater research and engineering community, resulting in broader gateway use and more widespread engagement in science by professionals, citizen scientists, students, and more. The project will officially get underway starting this summer. A science gateway is a community-developed set of tools, applications, and data services and collections that are integrated through a web-based portal or suite of applications. Such gateways provide scientists access to many of the tools used in cutting-edge research – telescopes, seismic shake tables, supercomputers, sky surveys, undersea sensors, and more – and connect often diverse resources in easily accessible ways that save researchers and institutions time and money. “Gateways foster collaborations and the exchange of ideas among researchers and can democratize access, providing broad access to resources sometimes unavailable to those who are not at leading research institutions.” said Nancy Wilkins-Diehr, SDSC associate director and PI for the entire project. TACC already participates in the development of a wide variety of Science Gateways such as DesignSafe, a National Science Foundation (NSF) grant to build a software platform, data repository, and tools that will help the U.S. design more resilient buildings, levees and other public infrastructure that could protect lives, property and communities. The goal of the institute is to enable new and existing Gateway projects such as DesignSafe to get the resources, services and support they need to be successful. Wilkins-Diehr also is co-PI of the NSF-funded eXtreme Science and Engineering Discovery Environment (XSEDE) program, one of the most advanced collections of integrated digital resources and services in the world. In her role with XSEDE, Dahan is excited to leverage her management and software engineering expertise to the Science Gateways Institute. In early 2015, the NSF identified science gateways as one of two focus areas for the implementation phase of its Software Institute program. Through a $500,000 award, a team led by Wilkins-Diehr developed a strategic plan for a much larger Science Gateways Institute as part of that Software Institute program’s conceptualization phase. An Incubator, to provide shared expertise in business and sustainability planning, cybersecurity, user interface design, and software engineering practices. This area will be led by Michael Zentner (Purdue University). Extended Developer Support, to provide expert developers for up to one year to projects that request assistance and demonstrate the potential to achieve the most significant impacts on their research communities. Led by Marlon E. Pierce (Indiana University). The Scientific Software Collaborative, to oversee a component-based, open-source, extensible framework for gateway design, integration, and services, including gateway hosting and capabilities for external developers to integrate their own software into Institute offerings. Led by Maytal Dahan (TACC). Community Engagement and Exchange will provide a forum for communication and sharing experiences among gateway developers – within the NSF, across federal agencies, and internationally. Led by Katherine A. Lawrence (University of Michigan) with support from Sandra Gesing (University of Notre Dame). Workforce Development will increase the pipeline of gateway developers with training programs, including special emphasis on recruiting underrepresented minorities, and by helping universities form gateway support groups. Led by Linda B. Hayden (Elizabeth City State University). In honor of the 2016 Week of Making, the NSF has awarded five different grants for early-concept programs. Each of these grants is $300,000 over a course of two years. Researchers at Rutgers Newark were awarded one of these grants.